I haven’t tasted chocolate for over ten years and now I’m walking down the street unwrapping a Kit Kat. Remember when Kate Moss said, ‘Nothing tastes as good as skinny feels’? She’s wrong: chocolate does. Having met the man of her dreams (and wanting a future and a baby together), she embarked on the hardest struggle of all: to beat anorexia. It was time to start eating again, to regain her fertility and her curves, to throw out the size-zero clothes and face her food fears. And, as if that wasn’t enough pressure, Emma took the decision to write about her progress in a weekly column for The Times. 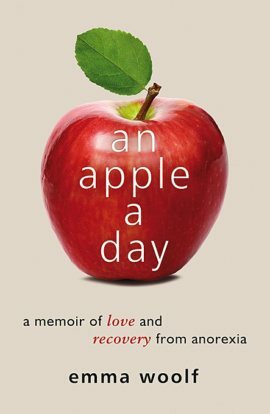 Honest, hard hitting and yet romantic, An Apple a Day is a manifesto for the modern generation to stop starving and start living. This compelling, life-affirming true story is essential reading for anyone affected by eating disorders (whether as a sufferer or carer), anyone interested in health and social issues – and for medical and health professionals. Emma Woolf is the great-niece of Virginia Woolf. After studying English at Oxford University she worked in publishing, before becoming a full-time writer. She is a columnist for The Times and also writes for The Independent, The Mail on Sunday, Harper's Bazaar, Red, Grazia and Psychologies. She was a co-presenter on Channel 4's Supersize vs Superskinny; other media appearances include Newsnight, Woman's Hour and Radio 4's Four Thought. Emma's first book, An Apple a Day: A Memoir of Love and Recovery from Anorexia was published in 2012 and shortlisted for the Beat Award for Recovery Inspiration. She was also nominated for Mind's Journalist of the Year. She lives in London. You can follow Emma on Twitter: @ejwoolf. Review of The Ministry of Thin in The Observer: "Woolf sets her stall out with brio. [...] Woolf's skill in is in adding intellectual and emotional ballast to the debates that interest her. In its best moments, this book emerges as a hypnotist's finger-click signalling women to wake up." Featured on BBC 2's Newsnight, 31 July 2012. Featured in Psychologies magazine, September 2012.